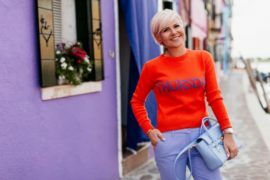 What to wear this autumn 2018? Where is the best shopping in Italy? The Italians like to say that life is not about roses and flowers; but I’ve always tried to see only the good. I would rather see the beauty in life than anything else. 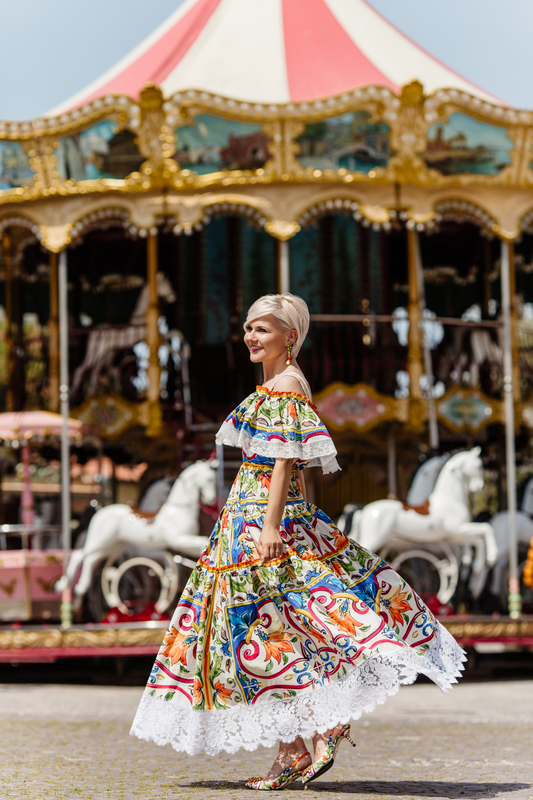 I married Andrea and moved to Italy ten years ago, not without a little apprehension not least because at the time I didn’t know a word of Italian – but with my beloved husband by my side and my dream in my pocket I made the jump from St Petersburg to Venice. For a year before the move I had been dreaming of Italy and becoming a personal stylist, so much so it would keep me awake at night. Back home I had taken some courses, done wardrobes for friends, but I hadn’t had a real client. I knew that before I could get started on realising my dream I would have to learn some Italian. I got a job at a big multinational and started doing just that. Nowthe very idea brings a smile to my face but at the time it was not funny at all. It was a rough start. From the very first day a couple of female colleagues took a disliking to me and began talking about me behind my back. I felt alone, as if no-one would understand me, like no one had experienced this before. But it was not all bad, my male colleagues were attentive, kind and would help even when I didn’t ask for it. I was determined to only see the kindness, but forever putting on a brave face wears you down, it got to the point that never a day went by without me being in tears. Through it all I never let go my dream, I kept repeating to myself that I would learn the language soon and become a personal stylist. More than anything I wanted to be someone in Italy, not just being the wife of an Italian. I never stopped believing in myself. Every morning I’d dry my tears, put on my pencil skirt and go to work. A year later, when finally, my Italian came good, I understood that the time had come. As I left the company’s building for the last time I felt lighter, taller and full of hope. I was finally on the way to meet my dream. It was spring time, the sun was shining, the birds were singing, and I was heading to the street where the best boutiques in town were found, feeling happy. ‘Her life’s dream’ is the mantra that would keep going in my head creating luxury wardrobes. Create harmonious looks and bring happiness to people’s lives with my work. First things first, I had some questions to answer. What would I expect and be worried about coming to a foreign country perhaps for the first time? How would I feel putting myself in the hands of a personal stylist? Would flitting from shop to shop, trying trousers in one, blouses in another, shoes in a third be something that I would appreciate? How would clients see a whole look together and see that the day had been tailored to them? Could I get a client to trust me? The answer to these questions: the ‘Full Harmonious Wardrobe’ – nothing short of providing perfection. I knew I would have to think through and select in advance, not only the main elements of the style, but all the details – scarves, belts and the like, creating different looks for any occasion and situation, every meteorological condition and suitable for every country. All that and making sure that everything matches, crafting an individual style that shows off a client’s best qualities not only their figure but also their personality. My goal was and is that once back home a client wouldn’t need to go shopping or make further purchases. I began to examine ranges in various boutiques but this proved easier said than done. There were difficulties at every turn. Some shops had limited ranges, others did not understand the necessity of reserving clothes in advance. One major problem was proving to people that there was even a demand for a personal stylist. In fact, it felt like most boutiques in 2008 did not understand what I was even talking about, like I was talking Chinese. What’s more, ten years ago I didn’t own anything from either Dolce or Gabana. Yes, I was a stylish lady, but my clothes were purchased on high street. More than once people looked down their noses at me. When this happened, I would cross this particular boutique off my list, if they didn’t treat me with respect, I couldn’t be sure that they would not treat my clients the same way. 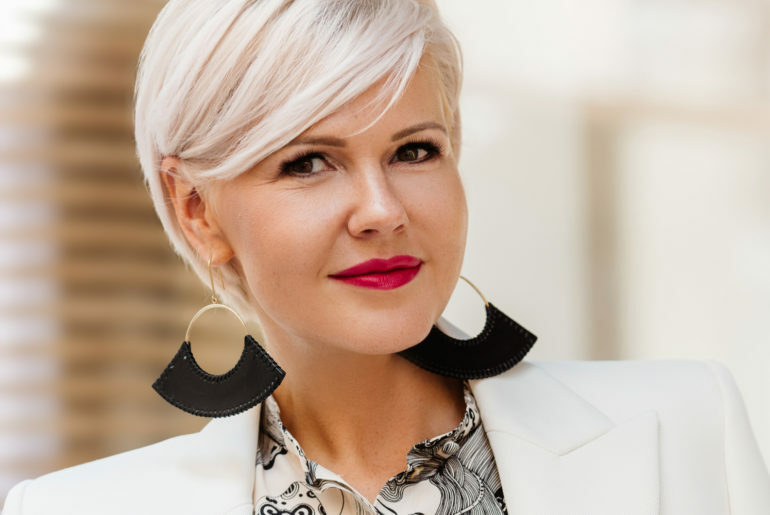 Being a successful personal stylist is all about creating and maintaining relationships, with boutiques as well as clients. I had a clear idea of how I wanted to work, creating fully functional wardrobe and allowing the client to try everything on in one place. But the boutiques wouldn’t accept these terms. Only my dream was keeping my heart warm, lighting the fire and empowering me to move forward and not give up. And then, when my energy and enthusiasm were fading I received a phone call. On the other end there was a man, he introduced himself as the owner of one of the biggest multibrand boutique chains in the region. My heart started beating faster, I was full of emotions. I don’t remember our conversation very well but when I hung up, I was holding a note in my hand, a note with a date and a time for our first meting. Two days later, I laid out my proposition: to prepare a client’s full wardrobe, in advance, offering a discount on new collections and working during the hours convenient for my customers. They listened eagerly. This kind of partnership with a stylist was new and unusual for the boutiques but I managed to convince them about the prospects of our relationship development. From then on, we began working together. At the same time, I started creating my first website, I had to get the word out to potential clients about myself and my exclusive services. At first it was a very modest webpage with my approach to shopping and some photographs of wardrobes created for my friends. Apart from talking to boutiques and launching the website, I was looking at other partnerships and business development. I tried to talk to the hotels in Venice but to be honest they were not very keen on talking to me. I would go from one hotel to another, with business cards and my website talking about how my service was unique but in responses would vary from strange looks to absolute incomprehension. It was draining. One of these days I came back home, wet through from the rain and tears, I remember that in despair I wrote to my close friend saying I was a looser, all my attempts were in vein and people were laughing in my face… There and then she told me the most important words in my life “Lots of people in you place, would stay on the sofa and dream their dreams. You got up from the sofa and are knocking on all the doors, you will see that it will pay off”. I took heart from the truth in these few sentences; feeling sorry about myself, crying and falling into despair is not for me. While wiping my tears, I received an email, as a sign from above – a letter from a first client! She had lots of questions, but importantly she was ready to come, and we agreed on a date. The day before the shopping with my first client I was checking carefully all the prepared outfits surprisingly it felt like I had been doing this all my life. I’ve never had this feeling before at any of my previous jobs. My first client was of modest means and was not too chatty, but, I saw how, while trying all the outfits she was transformed. Her eyes would light up I managed to guess her wishes and all the wardrobe fitted nicely. Believe it or not, the perfect size is still something that keeps astonishing my clients most of all – they are often shocked that I can choose the right size having never met them. In fact, there is no magic behind it because each client sends all his or her measurements in advance. The memories and details of the first day are a little hazy. It seems that the emotions were so strong, but since then the only idea stayed with me; when you really want something, the universe will help you! Paulo Coelho was absolutely right! The next two clients were very difficult. Undoubtedly, if I didn’t believe in my dream I would have given up. Client E openly nitpicked, looking for problems and mistakes. She would confuse me with inexplicable comments, she couldn’t comprehend at all that I was sincerely interested in the process and I wanted to create the best wardrobe possible for her at the best price. As hard as she looked she couldn’t find any snags in what I had chosen for her, this made her angrier and angrier. The end of this shopping day was more than unexpected…. told me that she now could work as a personal shopper in the country she lived herself – Europe. And she came to see how she should be working. The reward for all these difficult moments was my fourth client M. It was a real delight. This is how I remember my day with her. She was absolutely amazed by all the looks that I had prepared for her, she was astonished how all the prepared outfits matched and complimented each other. She understood the quality of what she was trying on, she couldn’t help being surprised of how it all worked together, how all the details worked together and how elegant and sophisticated looks for a business lady could be. I was snowed under with her compliments, she was thrilled with all my work, her words gave me wings. And confirmed that I was on the right path, that my services were appreciated, and there was a demand. And that my services bring delight and happiness to other women! I am eternally grateful to you, M., for not sparing you words and emotions and passing them onto me so many years ago. I remember very well how I was dressed that day; a simple pencil skirt and a modest white blouse. I also remember how awkward I felt because my client was dressed in more expensive clothes, but my heart was burning with a dream, making people more beautiful and more confident. M was looking in my eyes with respect and gratitude. This day will stay with me forever as the happiest day in my life. It’s after this client that for the first time in my life I bought myself an expensive dress so that this feeling of success and beauty would not leave me for a second. My first designer dress was from Diane von Furstenberg. That was definitely the moment of truth, it completely transformed my mind, it gave me confidence, I knew that from now on I’d be able to treat myself to luxury clothes from my favourite designers, and not just choose them for my clients. I was wearing Diane von Furstenberg dress all the season. Can you imagine it is still perfect, the quality speaks for itself. I keep it as a sacred relics, a reminder, that it was my first sensible investment in clothes, bought with the money I earned doing my dream job. Designer dress purchase opened me the door to the world of luxury designer clothes for myself. Straight after I bought Miu Miu sandals and, Oh My God! my first Dolce&Gabbana bag. Actually, we are still together and inseparable, I believe it brings me good luck. And when I buy new clothes, I still believe that less is more. The first year working as a personal shopper swished by. 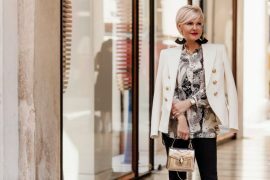 Amazingly, I still remember all my clients from those times, when shopping together was bringing us so many emotions, and I was totally immersed in the world of style, fashion and beauty. I was ready to work 24 hours a day with short breaks for Italian pasta and prosecco. 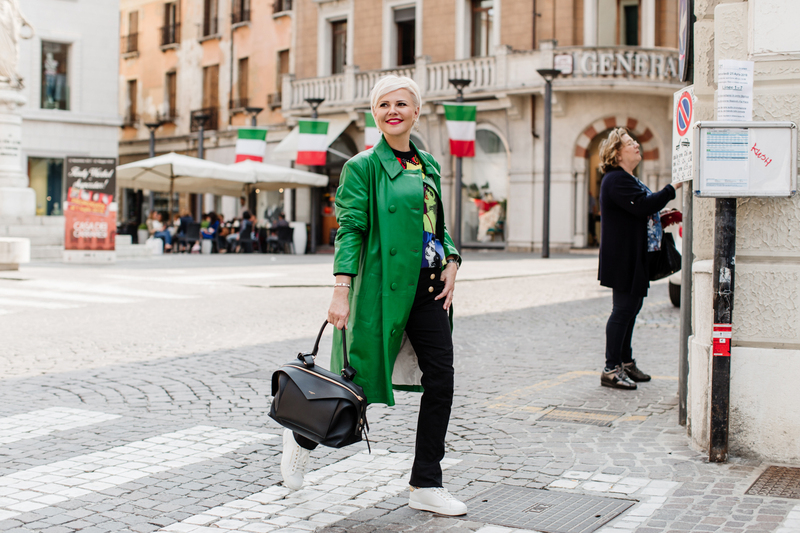 My dream was calling me…The Italian Fashion Academy was calling me. The very Academy I was dreaming about the very first days I arrived in Italy. I was dreaming of studying there, learning about all the subtleties of this profession, all the distinctive features of haute couture and diversity of fashion designs. I was hoping I could afford at least a short-term course. But unfortunately, it was out of my budget at the time. That’s why I let go off this dream as a beautiful balloon. I just tirelessly worked hard, trying to get as much information as I could from books, magazines, leading fashion houses websites. It looked like, my imaginary balloon, filled with my thoughts, had reached the addressee, as it was The Fashion Academy who was calling me! They were not offering me a place on a course, no! The Academy was telling me that they’d heard a lot about my work and professional success and would like to invite me to give lectures! The Academy was looking for new areas of development and was interested in practicing stylists, not just those teaching the theory. They were opening a new course based on theory and practice called “Image-consultant” and wanted me to apply among other candidates as they’d heard so much about me. After this phone call I was not able to put the pieces back together for a few minutes. I was not sure anymore if I was still in Russia, in Italy or it was just a dream. I remember bursting into tears holding a cold espresso in my hands, remember being so grateful to the Universe, millions of words of gratitude going through my head. Sometime later, having passed all the stages of the interview process, I officially started working for the Academy as a lecturer. This is how my personal non-stop marathon began. Every weekend I was writing the course outline in Italian. Well, I was actually dictating my thoughts to my husband and he was writing everything down as my written Italian was at the time far from being perfect. It was incredible time! We were spending the evenings and week-ends working together without feeling tired or scared or lazy. We were walking hand in hand towards our dream, my darling husband never had any doubts about my aspirations. He believed in me and in my potential and he was supporting me like anyone else! I was teaching the Italians, it was important to be extremely well prepared with the theoretical part and the practice since some of my clients were the boutique owners in Venice. Andrea was amazing, he was fully aware that it would have been so much more difficult for me without his help. Instead of spending his weekend at the beach and enjoying his free time he was really trying to fully understand all the intricate details of my profession. And I really needed his support especially with the beginning of the academic year. I started giving lectures and I was combining the work as a teacher with the work of a stylist. A year later we were celebrating my students’ graduation! I literally fell in love with my first students, we were on the same wavelength and became very close. Surprisingly, in life as at work, positive experiences rub shoulders with difficult situations. So, literally from the first days of the second academic year I was struggling with the course full of spoiled young girls whose parents were paying for their studies. They weren’t doing their homework at all, were chatting during the lectures and didn’t seem to be putting any effort into the studies, for them a stylist’s job was all about flicking trough a fashion magazine no strings attached. When the practice began the girls started complaining how hard it was, they were not expecting this work to be so physically and psychologically demanding. Witnessing this kind of attitude, I was on the verge of giving up myself. I was keener on investing my time and energy into my clients than into hopeless daddy’s girls. But the Academy insisted on continuing the course as the interest in this field was only growing and they asked me toexpand the course andincrease the hours. I had a clear understanding that there was no coming back for me, I was there to overcome all the difficulties and win. Yes, it was extremely difficult for me to work on the second year, but I kept telling myself that I was doing the job of my dream and if I were to become a real professional who continuously develop his skills I should complete my work with my head held up high. Therefore, I devoted even more energy to teaching, despite the fact that there was so little time left for my family and my clients. The third year was the recompense for all my hard work and perseverance. It brought me so much satisfaction, the students were so inspiringthat it fully made up for all the efforts put into the preparation. Moreover, while working with the third year, I learned that I was pregnant with Sofia. 12 hours a day, everything seemed possible and easy to me! Unfortunately, at the 7th month of pregnancy my life proved me otherwise, I could not walk and had to stay in bed for the rest of the pregnancy…. Perhaps some external forces were showing me that it was time to slow down, that it was impossible to constantly live at such a hectic pace! So, I realised that it was time to quit teaching. Knowing that I had achieved a lot and proved everything I needed to myself. Working full time, teaching and raising a child – was too much. Since then I have created thousands of wardrobes! My expertise was growing stronger and so were my clients. I’ve known most of them for many years. I’ve established a strong partnership with a network of multi-brand boutiques, their incredible range allowing to create endless variations of wardrobes for various occasions. Over the years, I’ve managed to build a special offer for my clients, it has even become one of a kind! I am sincerely proud that I can offer the service of the highest level and as proof of that I keep receiving the most kind and genuine sings of appreciation from the customers! © 2018 Anastasia Slabunova. Made by Sukhanov Brothers™.